Whether one has ever been in a fancy ballroom as an observer or participant, or tuned in for an episode of Dancing With the Stars, most have at least an idea of how a waltz is performed. 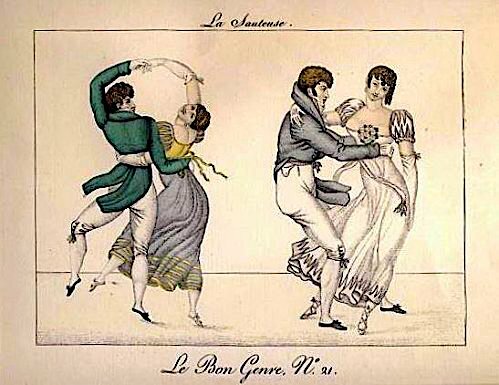 Readers of Jane Austen and Regency romance surely have read hints of the waltz as the “scandalous dance” of the era. How accurate this depiction is a matter of debate and one reason for this blog post. Naturally, as with most things that have existed over the long tracks of time, there is a history to the waltz which includes a host of alterations from what the dance was in the past to what it is now. I find that studying the etymology of a word or phrase is a perfect place to start. (noun) – A round dance performed to music in triple time, extraordinarily popular as a fashionable dance from the late 18c. to late 19c. 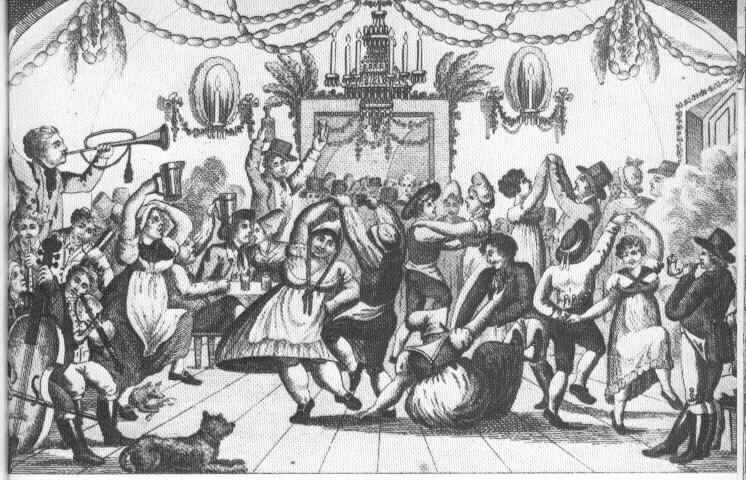 The dance itself of Bohemian origin; from the Old High German walzan > “to turn, roll, dance,” dated 1781. The “turn” portion of the definition is the essence of what sets this ballroom dance apart from the majority of the dance styles that came before. Precursors, such as the allemande and minuet, were dignified and rigid dances performed in two lines. The partners moved back and forth as they circled one another, sometimes going under the arms or a few other maneuvers, but generally in a straightforward manner, with touching exclusive to the hands and switching dance partners common. The waltz, conversely, was born from the landler (a peasant dance in ¾ time) which involved robust movements, such as lifts into the air and twirls, and required lots of space. The waltz, created at the country cotillion and contra-dances in Austria and Bavaria, refined the wild landler into a polished, graceful dance, but without losing any of its liveliness. As the waltz grew in popularity amongst the lower classes, it crept into the ballrooms of Vienna, and this is where the controversy over the “Viennese Waltz” began in earnest. The biggest hurdle was that partners were allowed to touch in a far more intimate way. Labeled a forbidden dance well before the tango earned that title, the waltz was universally panned by Austrian officials and Church leaders. Not surprisingly, as with most things that are declared “forbidden” or deemed scandalous, ever-rebellious youths embraced the invigorating waltz, which meant it subsequently thrived and spread. Between the 1830s to 1840s, Josef Lanner and Johann Strauss Jr. reformed waltz compositions into the sophisticated music it now is. By the time Strauss – “The Waltz King” – introduced his stirringly sentimental composition “The Blue Danube” in 1867, the Waltz had reigned in European ballrooms for over seventy years. The far more reserved English were less open to the concept of the waltz than the reluctant Germans and Austrians had been. Translation: they were vehemently opposed! The days of Queen Elizabeth dancing the equally intimate and fast-paced Volta were long past and pretended to be forgotten. We, with our modern sensibilities, can snicker at the stuffy English of 200 years ago. Or, we can try to appreciate the outrage by considering the typical English line dances of the time. 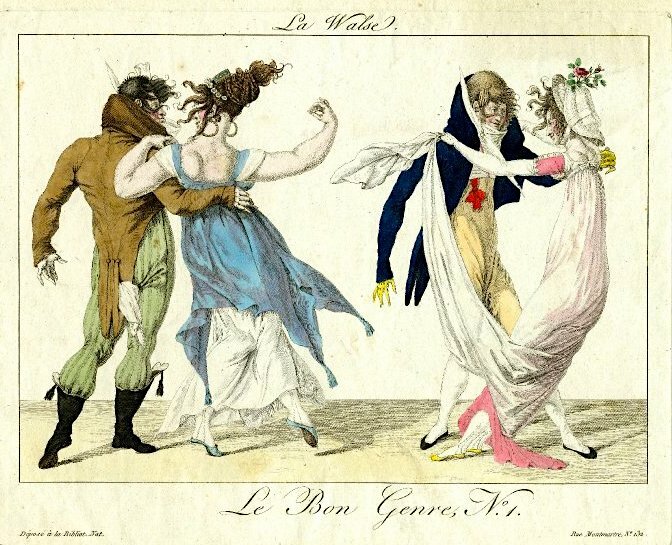 Whether at a country assembly or Almack’s in London, the acceptable social dances had been adopted from elevated French society and were characterized by a refined and stylized elegance. Dances were subdued, much less energetic, characterized by a stern attitude, and the patterns of movement were slow, complex, reserved, and precise. Most essential of all, English line dances were a group activity performed with the dancers often turning away from each other, an explicit line separating the sexes. Dancing partners were kept at arm’s length, coming together for relatively brief moments. Furthermore, the dancers typically wore gloves to make sure there would be no fleshly contact! You can hardly imagine a more diametrically opposite style of dance than the waltz. The waltz was danced in a close embrace with a single partner, the two gazing into each other’s eyes, and effectively isolated the couple in their own private sphere of intimate enjoyment. Similar to the waltz pathway in Austria, the working class English were swifter to embrace the new, freer style of dance. While perhaps generally more reserved than other European cultures, even youthful Englishmen have been known to rebel . . . particularly for entertainment AND the opportunity to flirt in a more intimate way. Worried parents complained that their daughters appeared in the intimate embrace of a man in public! They feared that the constant whirl of the dance would make young girls giddy and prone to lapses of good judgment. Oh no! Rumors spread of young women “running into the vortex of the waltz with impaired features and fatigued organs” to then fall dead in the arms of their partners. Other claims likened the after effects of a female waltzing to drinking three glasses of champagne! Compromises were made, such as slowing the dance down and requiring waltzers to straighten their arms so as to create a greater distance between them. The gloved hand of the gentleman was placed gently on the waist of the lady at virtually a full arm’s length. Her gloved hand rested lightly on his shoulder, while his other arm remained open and acted as a shelf for her other hand. Their bodies were covered head-to-toe in layers of clothing and would literally be a foot or more apart! Still, there is no denying the romantic nature of dancing in such close proximity with the exclusion of all others, especially if the couple were in love. Caricature prints, such as the two above, while essentially factual, exaggerated the scandalous aspects of the waltz. This increased the near hysteria and the reputation of the waltz as a wicked dance which must be stopped! Obviously, the efforts were in vain. All of Europe was immersed in the “Romantic Period” with everything focused upon LOVE. The waltz arrived at the perfect time. WOW! Exaggerate much? Despite the negativity, the waltz was here to stay. In 1816 the first treatise on the waltz was published. A Description of the Correct Method of Waltzing, the Truly Fashionable Species of Dancing was written by dance master Thomas Wilson. Wilson strived to tone down the objectionable parts by, for example, describing the dance’s steps using the strict, technical balletic five positions of the feet and warning against all attitudes and movements that were not “graceful and pleasing.” His stated purpose for the book was the intention “of remedying so great an evil” as he saw the erroneous judgment of the waltz. As seen in the image below from A Description of the Correct Method of Waltzing, a formal and controlled waltz style was described. Wilson also distinguished between two main types of waltz: French Waltzing, danced high on the toes to slower music; and German Waltzing danced on a flat foot to faster music. In either type, Wilson presented a waltz that was far removed from the wilder waltz as depicted in the two caricatures above. However the waltz was danced, it was extremely vigorous. The circular rotation meant the dancers were constantly turning both clockwise and counterclockwise, switching steps and directions rapidly as they progressed around all areas of the dance floor. The steps were not nearly as intricate as most country line dances, but the fast pace made the waltz very difficult to master. Best danced by those who were young and healthy, the exhausting waltz could be downright dangerous to those past their prime! More than any other dance, the waltz represented the abstract values and ideals of the Romantic era: freedom, character, passion, and expressiveness. By the mid-1800s, it was firmly established as the most popular dance in all of Europe. Strangely, the normally staid and proper Queen Victoria was a keen and expert ballroom dancer with a special love of the waltz! Modifications evolved as the decades passed: the pace slowed in half to solve the problem of “waltz exhaustion” and music written for the waltz decreased the tempo, lending a sweeping, smooth, confidence to the movements. The intimate and tightly clasped embrace became the standard frame. 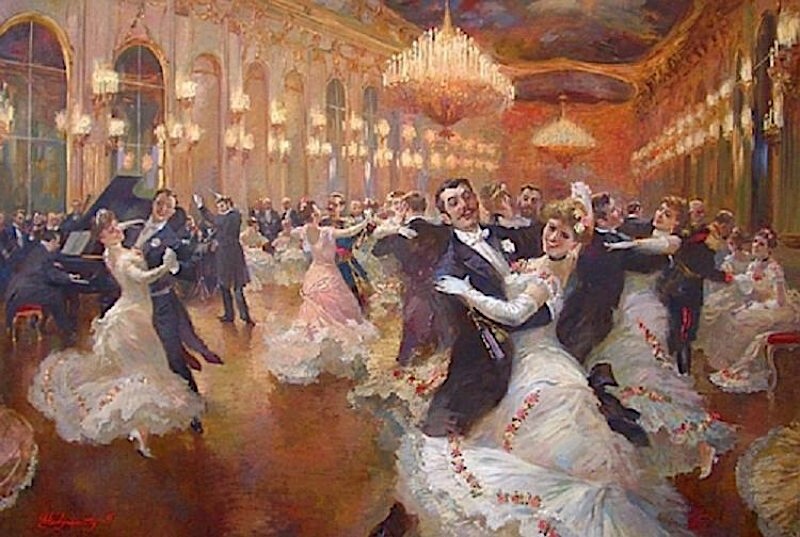 In time, the newer form of waltzing — the Modern Waltz — was established as a unique dance in stark contrast to the historical Viennese Waltz. 4 Comments for Come “Waltz” With Me. 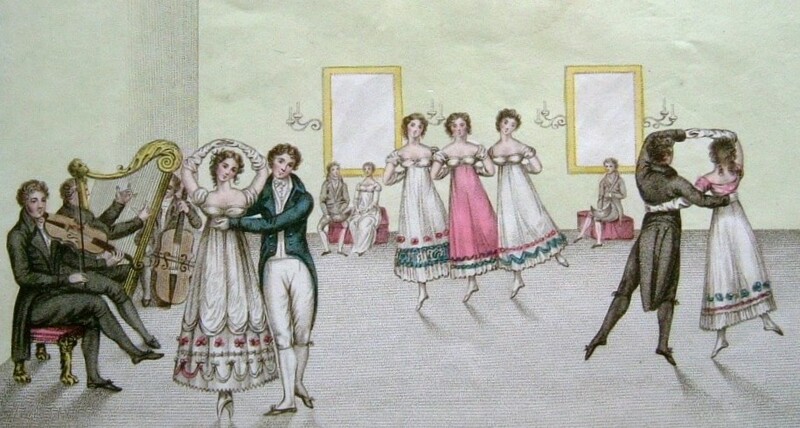 A History of the Supreme Dance of Romance. Cara has studied the dance extensively and her interpretation agrees with most of the dance experts.. Thomas Wilson . the Dance instructor for the Opera and owner of a dance school, published a book with music on dances with several waltzes.– country type dances where one did go to the head of the group. The scandalous waltz he calls e the German or French of Belgium waltzes and published a book about them around 1816.. I don’t fault you for thinking Emma and Frank were dancing the scandalous waltz because it is mentioned as such in several Austen studies. However, various other sources are quite clear that that was a dance in waltz time, called a waltz but was still more a country dance. I tend to go with Wilson. Lady Caroline Lamb said that Byron forbade her to dance the waltz but one can’t believe what she said. He did write a satirical poem The Waltz pretending to be a country gentleman who was scandalized by the dance. Many take the poem at face value but I don’t think he cared whether prole danced the waltz or not. There were letters in the newspapers and magazine about the scandalous waltz around 1812.
people not prole .. how did that word get in there? How fascinating, Cara! I actually “stole” that quote and the assessment from two sources, both Austen “experts” (as I do not claim to be) so I did not question the validity. Cracks me up! Oh well, it still sounds good. Ha! !